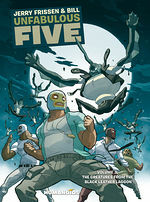 Between battles and laughs, a story of acceptance, camaraderie, and tradition set in the world of Lucha Libre. 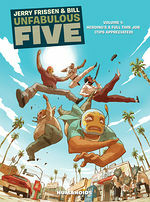 Lucha Libre, the Mexican art of wrestling, has made its way to Southern California in the form of the Luchadores Five, a gang unlike any other. Their mission is to clean up the East Los Angeles community they live in. 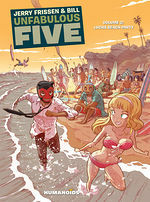 But despite their best attempts to get rid of crime in their hometown, "The Unfabulous 5," as they are sometimes known, are regularly arrested by the police, roughed up by a myriad of other gangs, including Werewolves and angry Frenchmen, and ridiculed by the public and their loved ones. It is within this rich Lucha Libre universe, with all its eccentric yet lovable characters, that the social issues of today are addressed in imaginative and hysterical ways. Unfabulous Five is a lot of fun with great art, and a sympathetic cast any bloke can relate to. Nice one. A nice little summer charmer and an interesting achievement with unusual origins. This is probably as close to magical realism as I’ve ever seen in a comic book. And I like that.